Whether they are long, slender carrots, big, plump carrots or miniature baby carrots, a long list of positive attributes make the bright orange vegetables one of the best snacks. Carrots are flavorful, nutritious, readily available, convenient and portable. Choose crisp, firm, dark orange carrots and avoid carrots that are soft, shriveled or wilted. Like all deep-colored orange-red vegetables, carrots provide generous amounts of beta carotene, which promotes good eyesight, healthy skin and resistance to infection. Potassium assists in moderation of blood pressure while fiber helps maintain a health intestinal tract, controls blood sugar and promote healthy cholesterol levels. Carrots also contain calcium, vitamin C, iron and vitamin K, which promotes healthy blood coagulation. Prepare carrots just before you're ready eat them or pack them in your lunch. 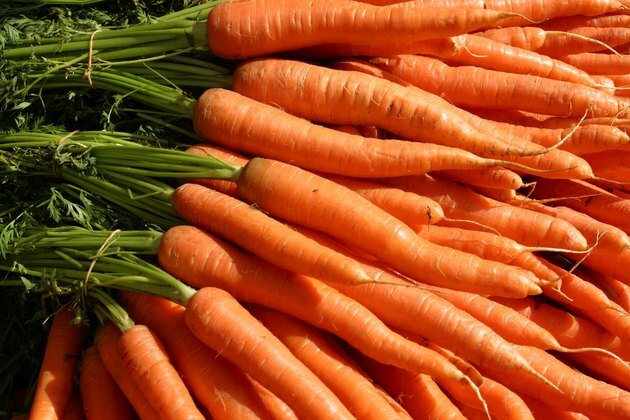 Don't wash carrots before storing them in the refrigerator, as moisture causes vegetables to deteriorate rapidly. Wash carrots under running water, using a vegetable brush to remove dirt and grit, then use a paring knife to cut off the stem end and the tip of the root. Peel large carrots, but leave tender, small carrots unpeeled as many of the carrot's nutrients are located in the outer covering. Snacking on carrots may help you maintain a healthy weight or lose excess weight. If you're hungry, skip sugary or fat-laden snack foods and munch on raw carrots, as 1 cup of chopped carrots contains only 62 calories, with no fat or cholesterol and very little sodium. Because carrots are a good source of fiber, just a few may be all you need to keep hunger at bay until the next meal. Fresh carrots are available in supermarkets year round. Most often, supermarkets stock carrots that are small to mid-sized, as the tender carrots are sweeter than larger, more mature carrots. Carrots may be sold with the tops intact, or the tops may be removed. You can also purchase miniature carrots packaged in bags, washed, peeled and ready to eat.